I'm in love, Ooooo   I'm a believer! 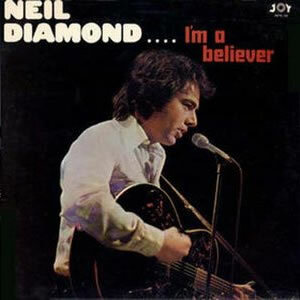 I'm a Believer is a song composed by Neil Diamond and recorded by The Monkees in 1966 with the lead vocals by Micky Dolenz. The single, produced by Jeff Barry, hit the number one spot on the U.S. Billboard Hot 100 chart for the week ending December 31, 1966 and remained there for seven weeks, becoming the last #1 hit of 1966 and the biggest-selling record for all of 1967. Because of 1,051,280 advance orders, it went gold within two days of release. It is one of the fewer than thirty all-time singles to have sold 10 million (or more) copies worldwide.